Ethics and Law for School Psychologists is the single best source of authoritative information on the ethical and legal issues school psychologists face every day. 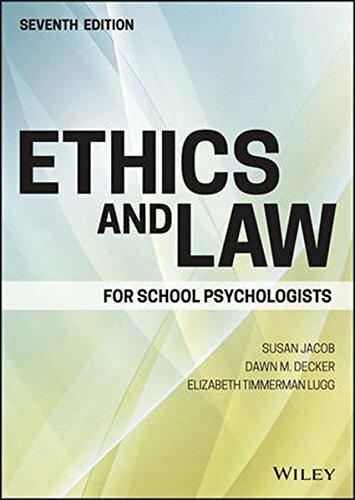 Designed specifically to meet the unique needs of psychologists in school settings, this book includes the most up-to-date standards and requirements while providing an introduction to ethical codes, ethical decision making, and the legal underpinnings that protect the rights of students and their parents. This new seventh edition has been extensively updated with the latest research and changes to the law, with an increased focus on ethical-legal considerations associated with the use of digital technologies. Coverage includes new case law on privacy rights, electronic record keeping, the 2014 Standards for Educational and Psychological Testing, digital assessment platforms, the latest interpretations of the Individuals with Disabilities Education Act, and more. Ethics texts for counseling and psychology are plentiful, and often excellent—but this book is the only reference that speaks directly to the concerns and issues specific to psychologists in school settings. Case vignettes, end-of-chapter questions, and discussion topics facilitate deeper insight and learning, while updated instructor’s resources bring this key reference right into the classroom. Keeping up with the latest research and legal issues is a familiar part of a psychologist’s duties, but a practice centered on children in an educational setting makes it both critical and more complex. Ethics and Law for School Psychologists provides a central resource for staying up to date and delivering ethically and legally sound services within a school setting.